Spray a cookie sheet with cooking spray. For each halved squash, cut a thin slice off the bottom so they sit flat. Discard the bottom slices. Using a spoon, remove the seeds and any stringy flesh from the center, leaving about 3/4 inch of the inner flesh to form bottomless shells. Lay all the squash halves on the prepared cookie sheet, skin side down. Brush the squash with olive oil, inside and out. Bake in oven for 20-25 minutes or until soft and brown around the edges. In a small pot, cook the quinoa according to the package directions, replacing the water with Manischewitz® Vegetable Broth. When quinoa has fully cooked, place in a mixing bowl, cover and set aside at room temperature.In a skillet over medium-high heat, sauté the fennel in olive oil for about 4 minutes. Add the diced sweet potatoes to the skillet and mix well. Let the sweet potatoes cook for about 3 minutes. Add all the spices plus the sugar and mix well. Lower the heat to medium and continue cooking, stirring occasionally for another 8-10 minutes. (or until potatoes have turned slightly crispy on all sides, but remain soft in the middle). Add the dried cranberries and toasted nuts. Stir and cook for 1 minute, then remove from heat. 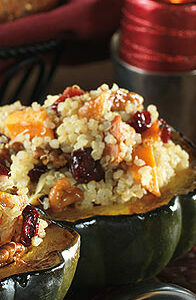 Add sweet potato mixture to your reserved quinoa and mix together. To serve: Spoon the quinoa mixture into the center of each cooked acorn squash, sprinkle with brown sugar as garnish and serve.